Hailing from Las Vegas, Nevada Shift has rightfully established his place as the resident DJ at the world's largest pool party, better known to all of you as REHAB in the Hard Rock Hotel. Summer, 2012 marks his seventh consecutive season as the anchor resident DJ. But that's not where it ends. He also resides, four years and running, at Wet Republic located in the MGM Grand Hotel for Maxim's Hot 100 Contest, as well as, Heart at Omnia nightclub in Ceasars Palace twice a week for the last five years. The Las Vegas Spin Awards awarded Shift the crown of "Best Main Room DJ" of 2012, quite the significant nod in a nightlife powerhouse like Las Vegas. Additionally he was awarded "Best Pool DJ" for 2010 and 2011, as well as "Biggest Following" in 2009. Now when he's not tearing it up in the city of lights he also jet-sets all the top entertainment meccas that this country has worth mentioning (LA, San Diego, San Francisco, Chicago, NYC, Miami). 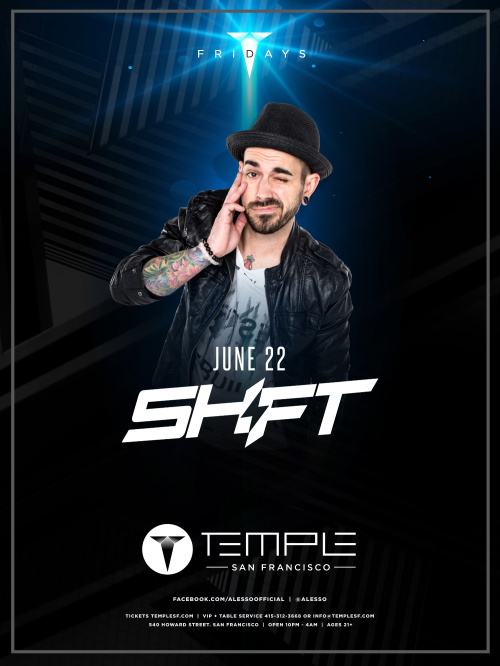 2018 marks his ninth year running with a continuous residency in the Bay, currently at the Temple nightclub. He may even be found enjoying the sandy beaches of Cabo at Pink Kitty or somewhere in the Virgin Islands shuttin' it down for the masses. But no matter where you see him it's guaranteed to be a night to remember so come prepared. LVL55 music to be announced!